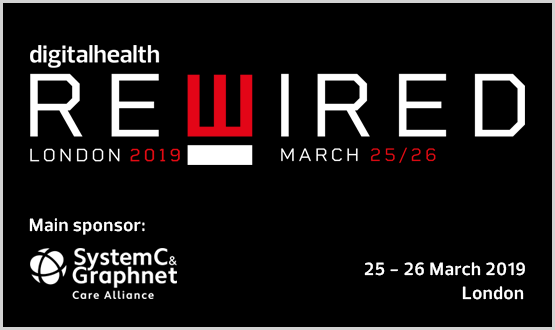 The full packed programme for Digital Health Rewired is now live, giving the full picture of the 80+ speakers who will be taking part across the eight tracks over two days, making Rewired the essential event for everyone working to secure the benefits of digital health for all patients. Rewired keynotes include: Matt Hancock, secretary of state for health and care; Doug Gurr UK MD of Amazon, speaking in his capacity as chair of the British Heart Foundation; Simon Eccles, national CCIO for health and social care; Dr Ben Goldacre, best-selling author and open data campaigner; Ali Parsa, CEO of Babylon Health; and Will Smart, national CIO for health and social care. Professor Shafi Ahmed, surgeon, futurologist and associate dean at Barts and the London, will provide a glimpse of the near future, in which VR, AI and robotics are transforming surgery and medical education. Day one of Rewired is the Rewired Leadership Summit, where sessions will include ‘The Long View of NHS IT’ which will bring former leaders back together to discuss the deeper trends of digitisation. The panel includes Andy Williams, former CEO, NHS Digital, and MP and former Minister for Life Sciences, George Freeman. Day two of Rewired is when the fun really begins, with the brand new Rewired Conference and Exhibition at Olympia. The Rewired Conference and Exhibition, will connect today’s digital leaders with disruptive innovation and showcase the very best local and national work of digital trailblazers in health and care. The main Integrated Care conference track opens with Dr Ben Goldacre followed by Doug Gurr and Matt Hancock, who will be giving his keynote at 11.45am. A glittering morning programme also includes Dr Harpreet Sood, on EPRs and clinical burnout in the Clinical Software track; Prof Neil Sebire of GOSH DRIVE will open the AI and Analytics track; and Will Smart will set out the next latest steps to secure the NHS in the Cyber Security track. Two rising UK digital health CEOs, Tom Whicher and Dan Vahdat will kick-start Cloud and Mobile; and the Innovation Stage will host the Rewired Pitchfest at which digital health 16 start-ups will have three-minutes each to pitch to the audience and judging panel of VCs and entrepreneurs to be named Rewired Pitchfest winner. Innovation Stage will hand over in the afternoon to the teams who have taken part in the two-day Rewired Hack Day to showcase their projects, with a community vote for an overall winner. The theme of how to create an innovation culture in health will be explored on the Integrated Care track by Dr Seamus O’Neill, chair of the AHSN Network and Ben Bridgewater, CEO of Health Innovation Manchester. They will be followed by three sessions showcasing how digitally integrated care is being delivered in Manchester, London and the South. The Clinical Software track will focus on the opportunities for open platforms and EPR 2.0, followed by sessions from Rewired Partners PRSB and Interopen, exploring the state of art on standards and interoperability. AI and Analytics meanwhile will spend the afternoon exploring the use of AI to support commissioning and application to improve patient safety. The Cyber Security track will turn to exploring patient data safely with Chris Bunch, CIO of Oxford University Hospital, and opportunities for regional collaboration on data security. We’re also partnering with the Royal College of Radiologists to run an afternoon Digital Imaging industry workshop on AI in radiology. Final details are still being confirmed, but speakers already include Nichola Strickland, president of the Royal College of Radiologists and Dr Christina Messiou from the Royal Marsden.